So let’s say you’ve got clients in a few different timezones and have to schedule things across multiple continents. Why not get a clock ? Why not get three ? The issue I have with clocks spanning multiple timezones is that an analog dial usually represents 12 hours, whereas the day is twice that. Which is fine if your bat-senses can tell you whether it’s daylight or not, but not so good if you schedule something for 11:00 in some godforsaken country without specifying whether it’s A.M. or P.M.
You can, as it turns out, get clocks that represent 24 hours on the dial. The ones that I like have midday at the top and midnight at the bottom, which if you orientate the thing right will cause the hour hand to point vaguely in the direction of the sun. 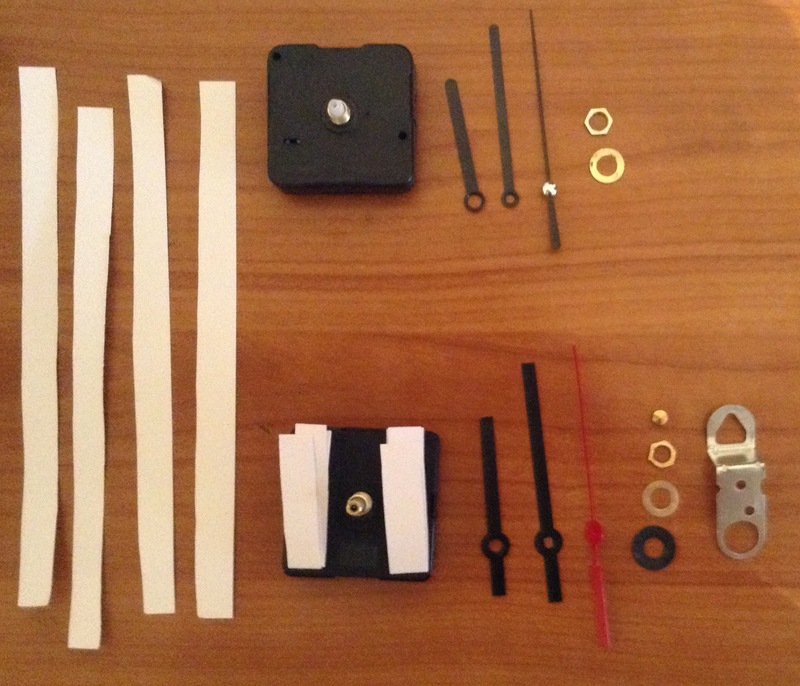 Some 24-hour clock movements (x3). 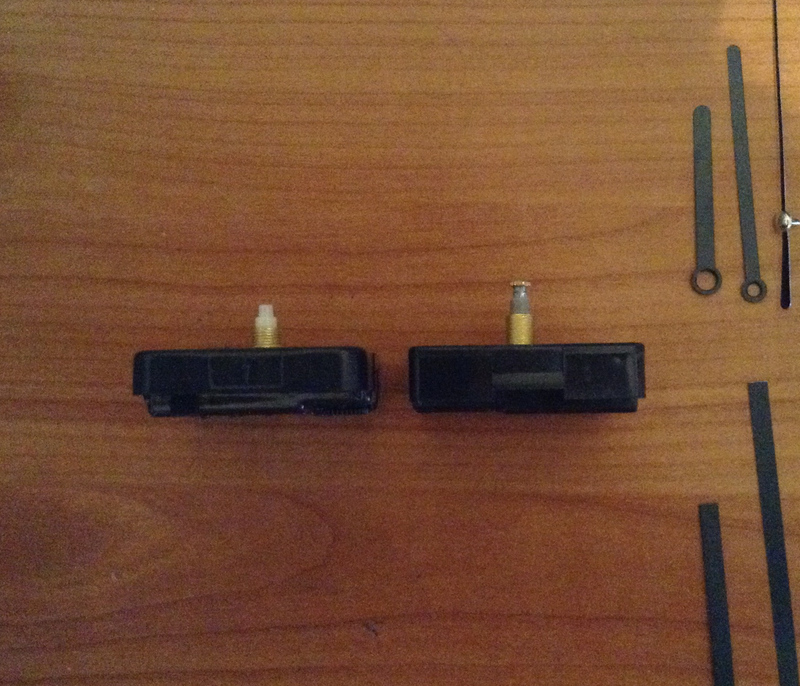 These little devices have half the number of gears or something compared to a regular clock movement, causing the hour hand to take 24 hours to do a 360 degree sweep of the dial. The form factor is relatively standard it seems, so you can pop one out of an existing clock and pop in a new one fairly easily. Most sellers bundle them with some hour, minute and second hands. 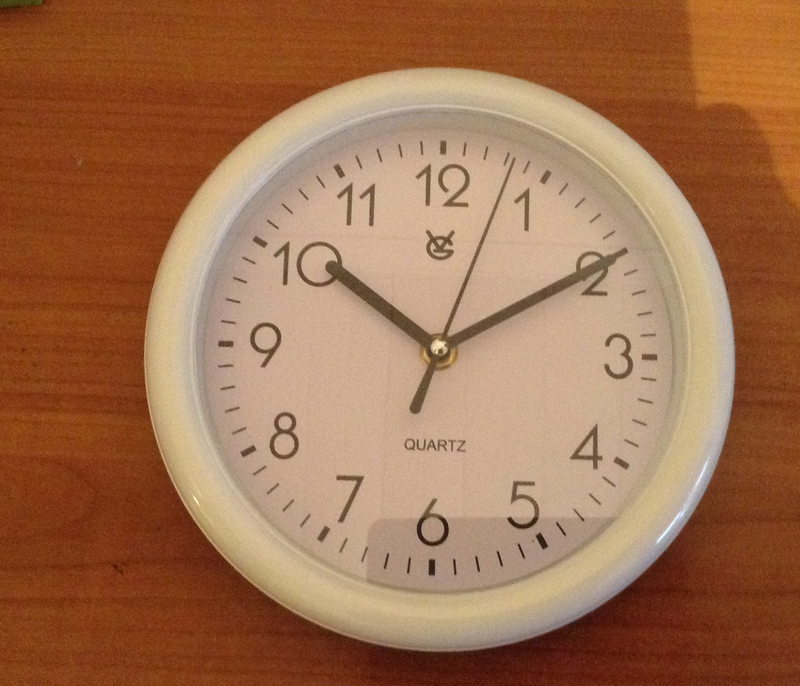 Some cheap clocks (x3). 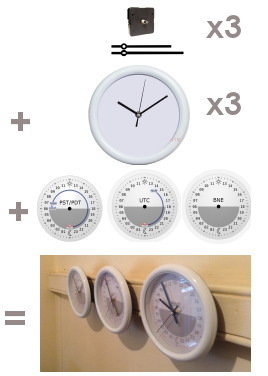 Ideally, the radius of the clock would be greater than the size of the hands you’re putting in it, but you can (a) use the hands that came with the clock, or (b) sever the hands with some scissors. 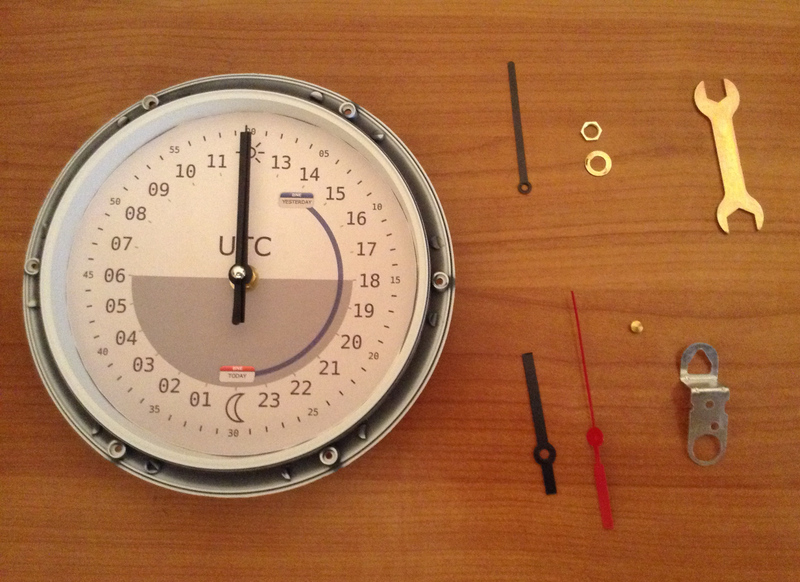 A 24-hour clock-dial design, including some instructions that I’m shamelessly ripping off their website. 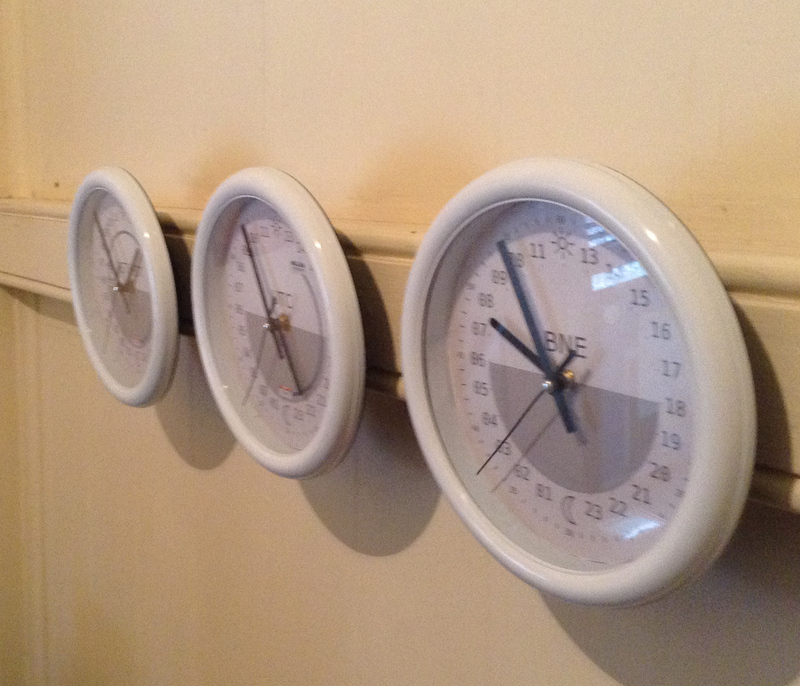 Put these on your wall and this will give you the ability to see what time it is in New York, Paris, and Dalby. Just like a newsroom. Once these things actually turn up, take them apart, put them back together, take some photos, and then write it up on your blog, changing everything from first-person normative into third, or whatever it is. To make things more interesting, I thought it would be useful to mark out on the clockface the hours of the day in which a Brisbanite observes a different day of the week than the timezone in which the clock is running. Since we in Australia are usually Living in the Future, we usually hit midnight (and a new day) before other people on the planet, at which point people off in, say, Timbuctoo, start living in the past (which is marked on the clockface as ‘BNE/Yesterday’). Eventually, Timbuctoo hits midnight, and both Brisbane and those weird foreigners both agree on what day it is (which is marked on the clockface as ‘BNE/Today’). The difference between these two times is their difference in timezone offsets so, for example, on the UTC clock, we disagree on what day it is for 10 hours of the day (BNE runs on Australian Eastern Standard Time (AEST), which is UTC+10:00, and UTC is UTC+00:00, surprisingly enough). 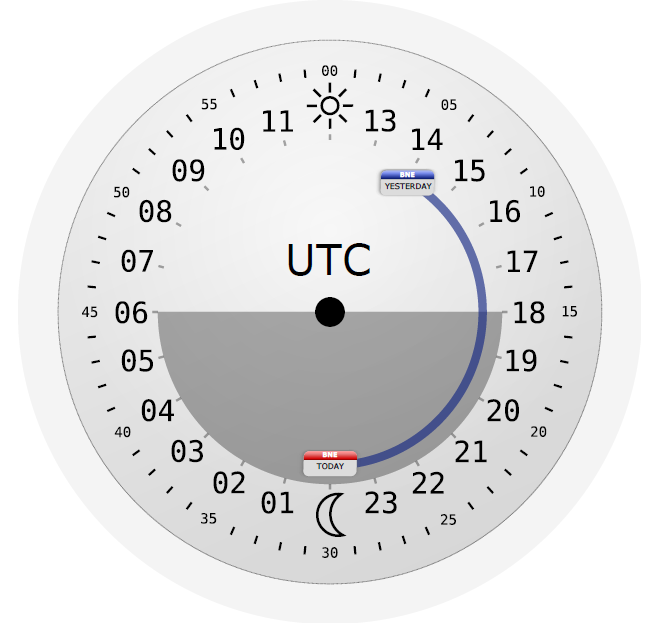 If you don’t know what UTC is, think of it as GMT, without the daylights savings but with the leap seconds. … and in Pacific Standard Time, for 18 hours of the day (AEST = UTC+10:00, PST = UTC-8:00 = 18 hours difference). 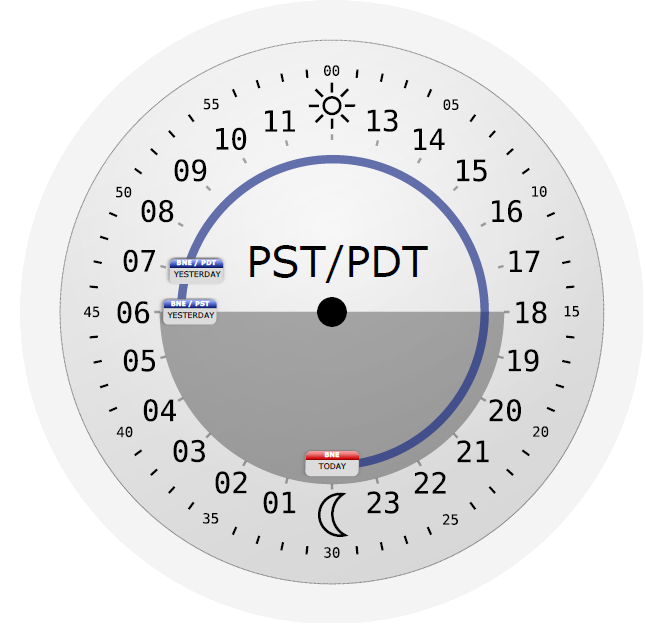 The time in Pacific Standard Time / Pacific Daylight Time (with yesterday marked in blue, from the perspective of someone in Brisbane). I’ve drawn this difference as an arc on the clock, which, if you pretend the clock is a top-down view of the planet with the arctic in the middle , would also draw an arc between their general locations on the planet, plus or minus 4,000km. 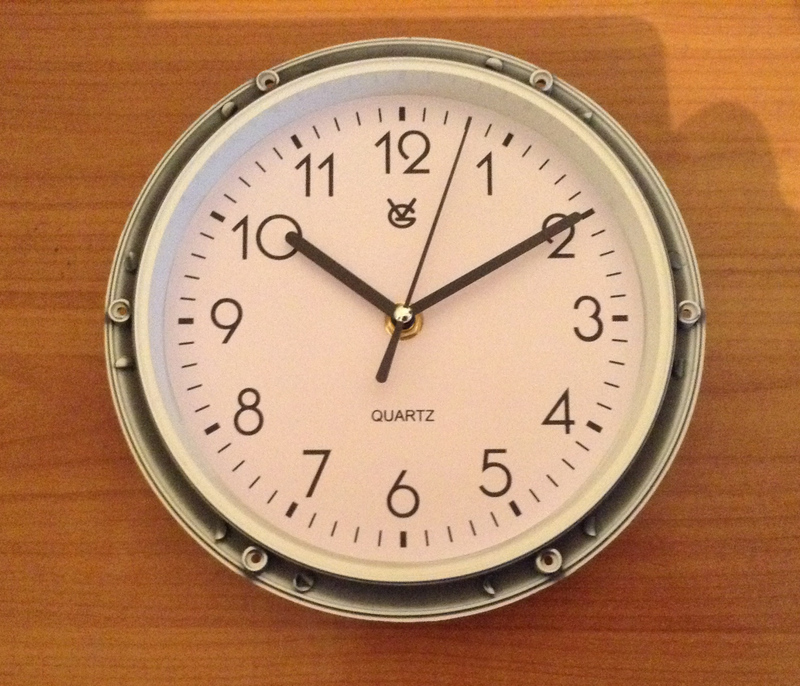 Things get more interesting with daylight savings (PST/PDT); I’ve marked both midnights on the clockface shown above. Things would be even more entertaining if the observer was in a timezone with daylight savings as well as the timezone of the clock, since that could increase the number of differences between timezones to four. Thankfully, Brisbane doesn’t believe go in for that sort of malarky. So anyway, here are the Inkscape SVG files, and some PDF conversions, since Inkscape likes to print out large blocks of black behind the image for some reason that I’m yet to determine. They’re based on the original SVGs at Steve Pomeroy’s website, which are published under a Creative Commons Attribution-ShareAlike licence, so here’s your attribution, Steve. Hang on. Forgot to add my rivetting photos of taking it apart and putting it back together. 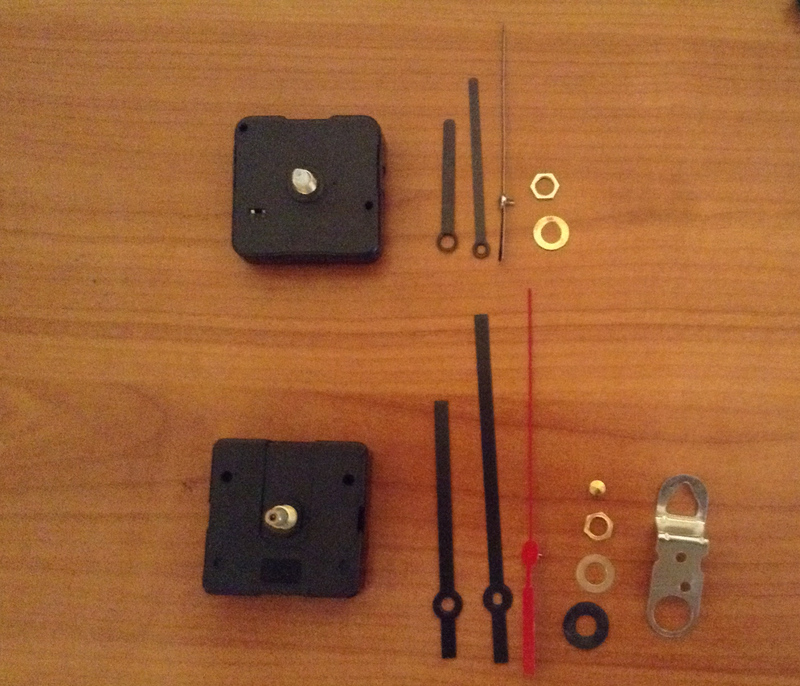 The thing to look out for here would be the size of the clock mechanism doodad, which was slightly bigger in the replacement than the original (see Image 4 below); requiring a few strips of folded up cardboard (Images 5 & 6). 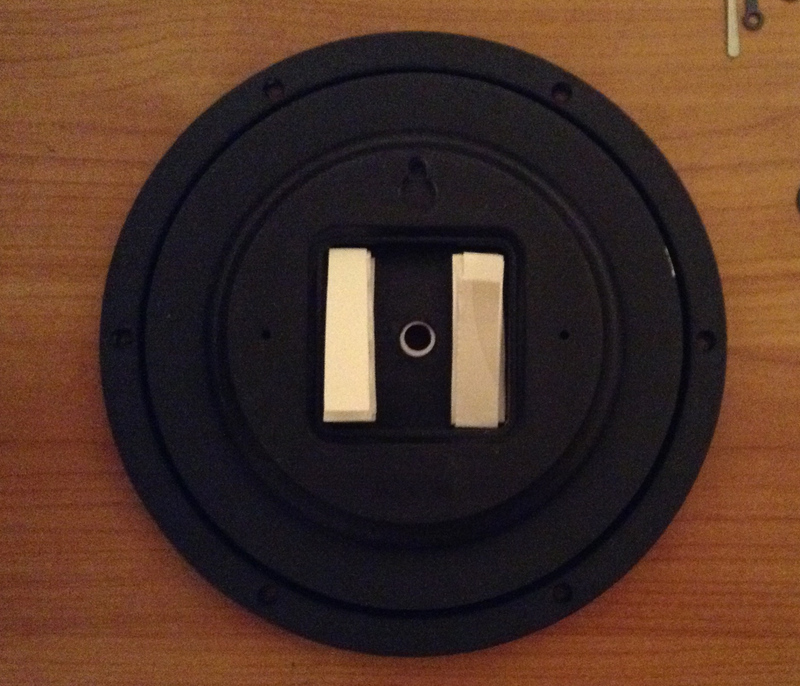 This pushed it back so that the mechanism didn’t squash the second hand up against the transparent cover plate; which was preventing the thing from working. Also, I had to chop the hands down to size and mix and match with the previous hands, to find ones that actually gripped the spindles properly. in the fine Islamic tradition. Brisbanite (n): one who lives in Brisbane. (see also: Brisbanian, Brisbanician). Yes, I’m aware the ‘Greenwich Mean Time’ doesn’t actually have daylight savings, but Greenwich the town/district/borough does, so there’s some possible ambiguity there, which is the sort of thing that people who work in IT try to avoid. so that the earth revolves in a counter-clockwise direction. If you like, stick a Postel zenithal equidistant projection in the middle. I’d extend the centre point to be half-way to the radius though, so that it looks more like a donut, and gives you a bit more room to write things in the middle.